orangutans are threatened with extinction by palm oil plantations. Mankind may be one of the orangutans' closest relatives but humans are also the greatest threat to the orangutans' survival. Orangutans used to live in many different parts of South East Asia, but the places where they can thrive and find food are quickly vanishing. In Borneo and Sumatra, their last remaining homes, large parts of the old growth rainforest are gone, ripped up for palm oil plantations. To grow more and more palm oil, used in cosmetics and food, the major palm oil producers are clearing and burning the last remaining rainforests. 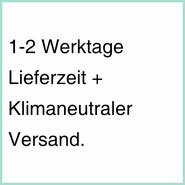 We help in 3 easy steps! 1. All HOPERY products are 100 % palm oil free. The palm industry is one of the most detrimental to our environment. 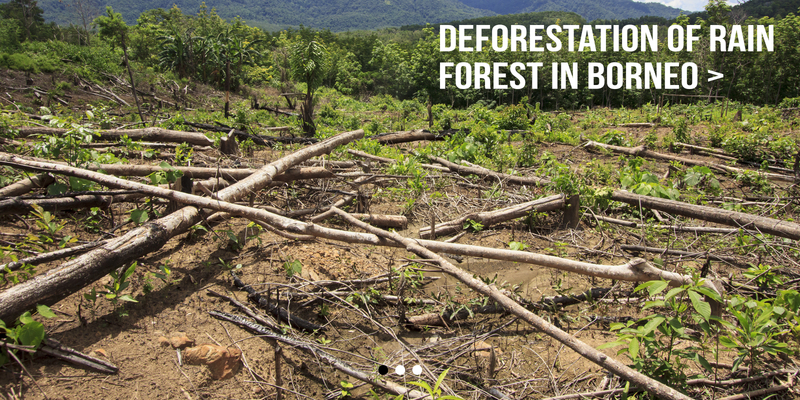 It is a leading cause of rainforest degradation, global warming and the displacement of indigenous people and endangered species. From the beginning of HOPERY we have avoided this ingredient in all of our products, a step most in our industry have not taken. 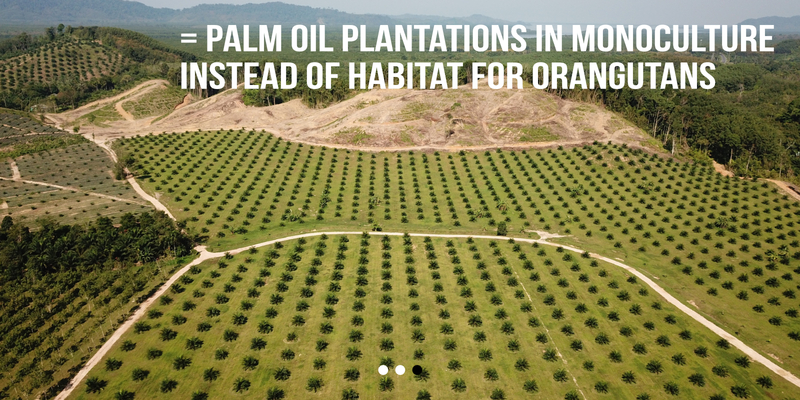 Isn´t it a good feeling to know that you are helping our planet by deliberately avoiding products containing palm oil? 2. We adopt orphaned Orangutans. By destroying their habitats, many orangutan babies lose their mothers. Some small orangutans are lucky enough to be rescued by the BOS Nyaru Menteng Orangutan Rescue Center. There they receive vital medical care and are lovingly cared for. Here begins the long journey back to a life in freedom. Newly arrived infants and very young orangutans spend the day in a forested nursery where they are cared for 24/7 by their babysitters. In Baby School, the orangutans learn to climb and move around in trees.They begin to experiment more with new fruits and also begin to interact closely with one another. After a few years in Baby School, as they grow stronger and more independent, the orangutans move up to Forest School. In Forest School, the orangutans begin to truly develop the skills they will need to survive as adults in the wild. Climbing and nest building as well as swinging and maneuvering amongst the trees are skills that they now practice every day. At the end of the long journey there is one big goal: the release into a suitable protected area. 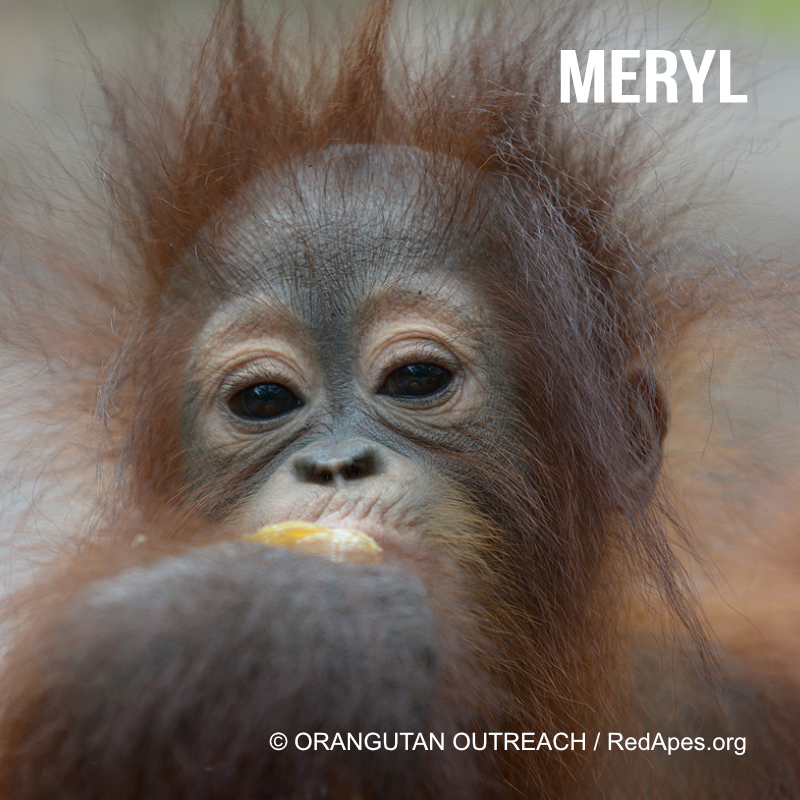 With your help we could already adopt 3 orphaned orangutans. THANKS! The islands of Borneo and Sumatra suffered catastrophic fires in the fall of 2015. 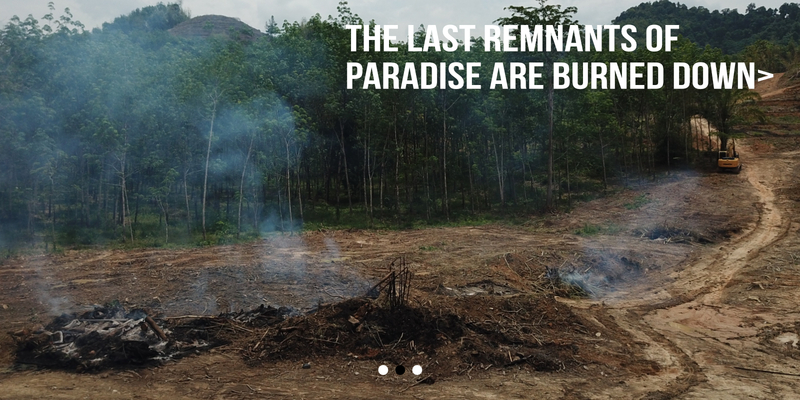 The fires were sparkled by humans to destroy the rainforest and to create palm oil plantations. 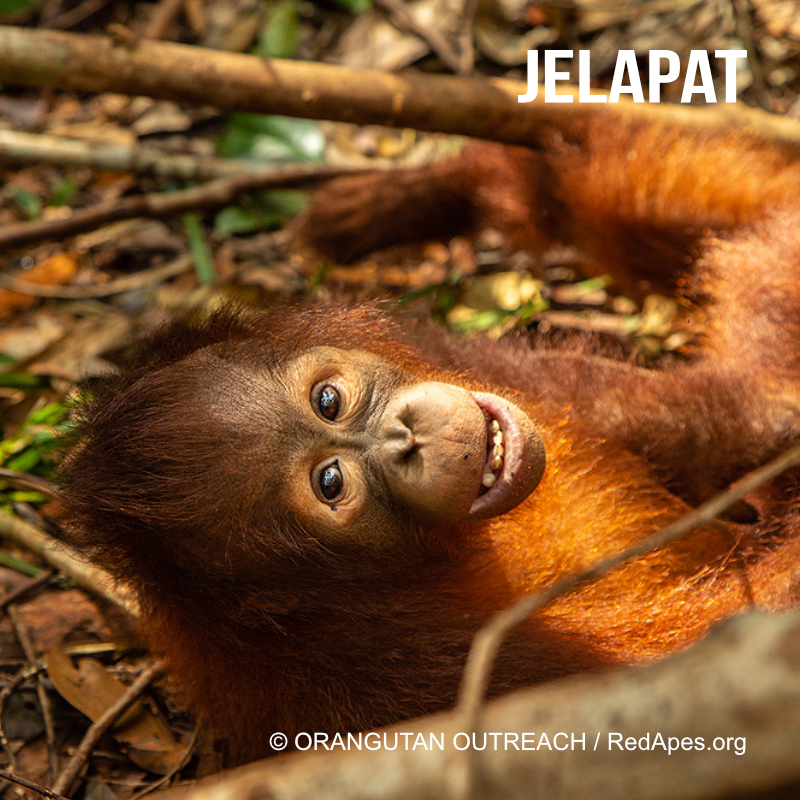 Jelapat was found in mid-December alone near the village of Timpah. His mother did not survive the fire. Jelapat was rescued and taken to the Nyaru Menteng Rescue Station. Jelapat was the fifth baby orangutan rescued by the team that month. 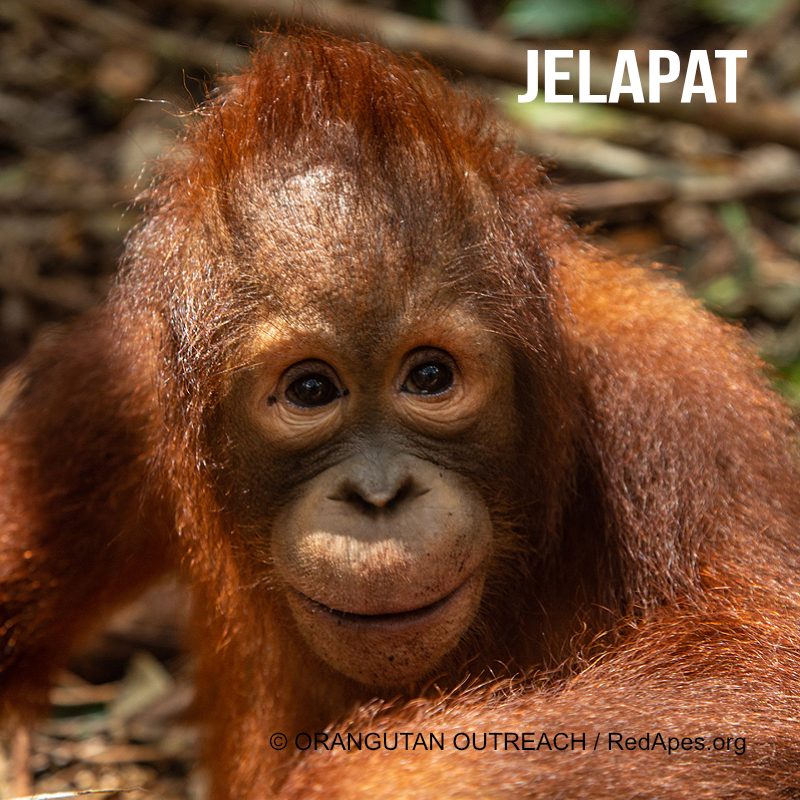 Jelapat has a new home in the rescue station and will be prepared for a life in freedom.He is taught all the survival skills he would normally have learned from his mother. Topan was handed over to the BOS Foundation on October 13, 2017. She was only 8 months old when she was rescued from Sigi Village, Central Kalimantan, and she was suffering from severe dehydration and malnutrition, and weighed only 3.5 pounds. Nine months after her arrival, 17-month-old Topan is now a member of Forest School’s "Nursery Small Group". 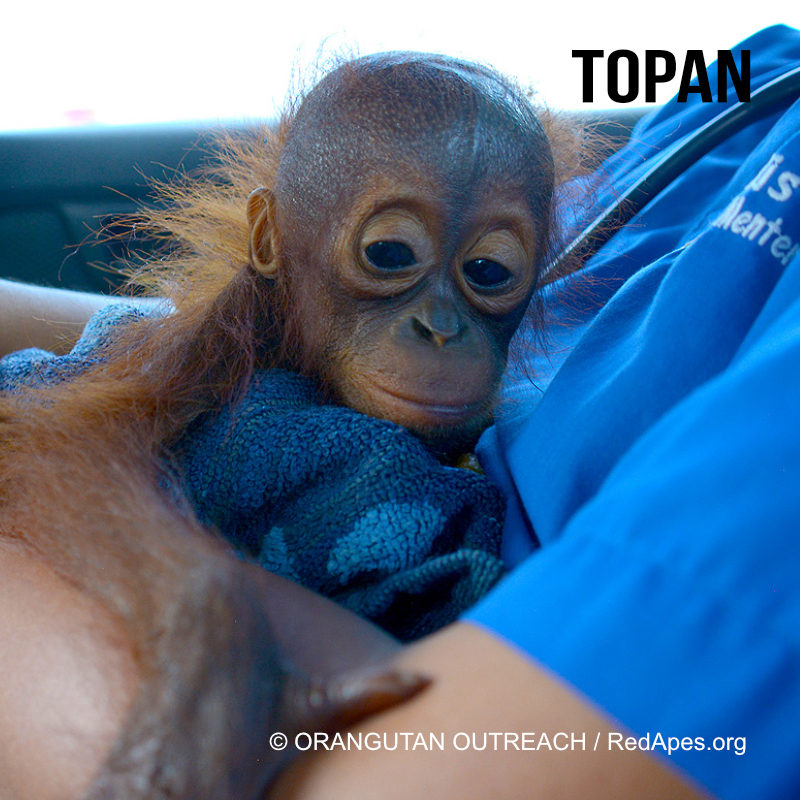 Dr. Arga Sawung Kusuma, the veterinarian-in-charge at BOS Nyaru Menteng, said: "Even though Topan is comparatively smaller than everyone else, she is much braver." 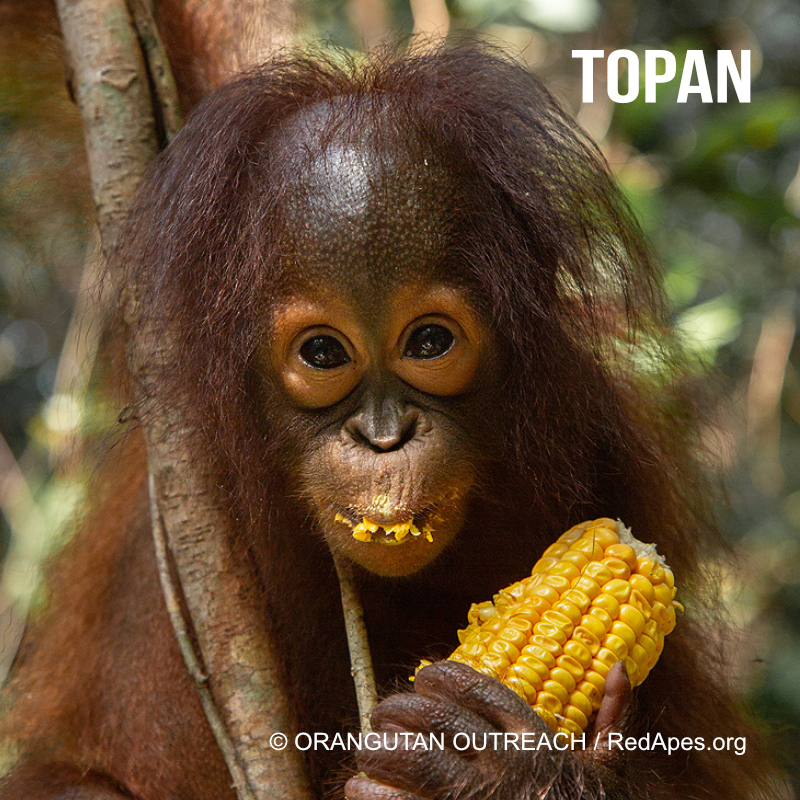 Asked what stands out about Topan, Vet Arga replied, "She once shocked us by climbing all the way up a 15-meter-tall tree! We were worried she would be too terrified to climb down, but she climbed down without much trouble at all. She just went ahead and did it!" 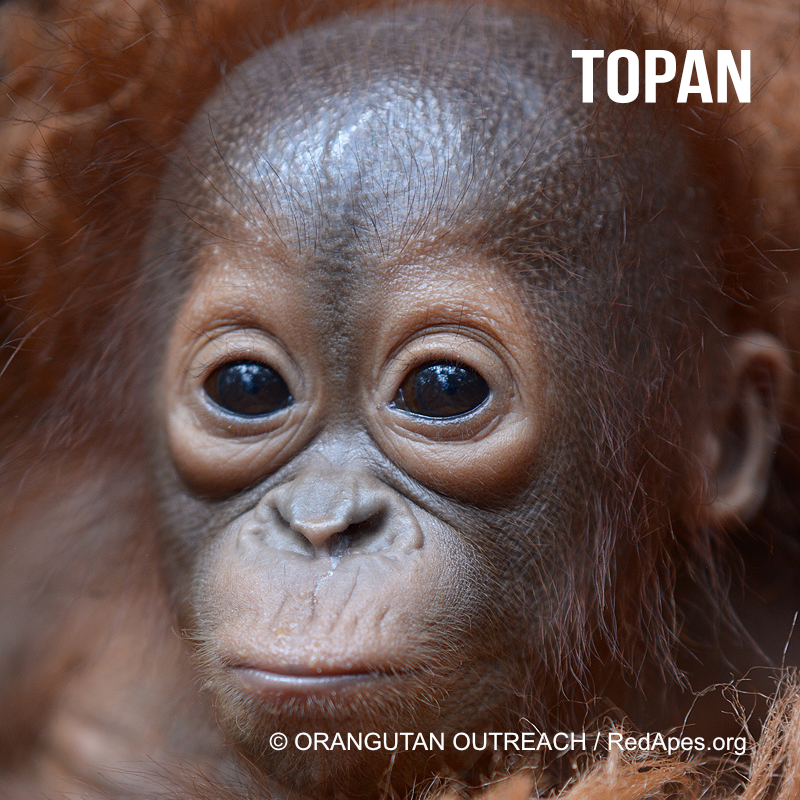 This fearlessness is a clear indication that Topan is developing wild behaviors. Early morning on January 7 2015, a joint rescue team from BOS Nyaru Menteng travelled to Tumbang Jiga Village after receiving news the previous day regarding a baby orangutan being kept by local people.This was the first rescue mission of the year. Meryl was found in a very poor condition. She was extremely weak and thin.The owner had placed her in a lanjung, a traditional Dayak bag made of plaited rattan, usually used for carrying crops or firewood. The baby, a female, could barely move inside the bag and was unable to move her right arm because it was so swollen. Thanks to the medical team and babysitters, Meryl made a full recovery and soon moved back to the main baby nursery playground for part of the day. 3. Together we support Orangutan Outreach. 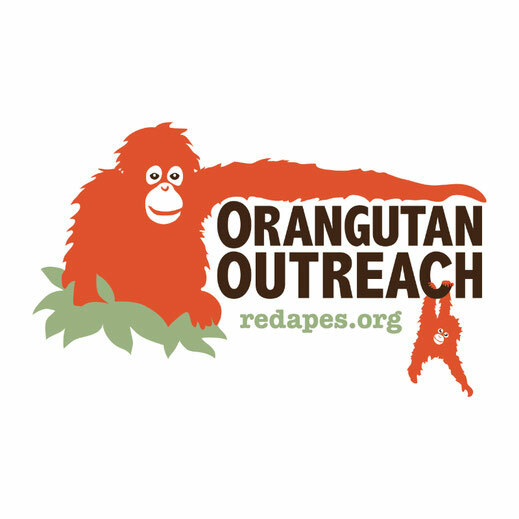 Orangutan Outreach is a registered 501(c)(3) US non profit charity based in New York. Orangutan Outreach's mission is to protect orangutans in their native forests of Borneo and Sumatra while providing care for orphaned and displaced orangutans until they can be returned to their natural environment. 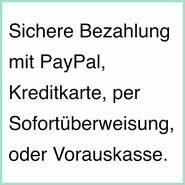 We donate 10 % of our profit to Orangutan Outreach. 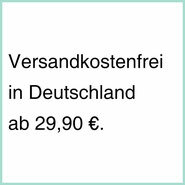 + with every HOPERY product you buy, you automatically donate 20 cents and help directly to save orangutans.